Posted in desserts, drinks, Middle Eastern, recipe by Antonio Tahhan on September 21st, 2008. You can follow any responses to this entry through the RSS 2.0 feed. You can leave a response, or trackback from your own site. I recently stumbled across your blog, and I have to say it has become a little treasure on the web! Very inspiring pictures. You really have talent! Congratulations on your blogiversary!!!!! Espero que cumplas muchos más :D. Aaaahhh a wonderful beverage Antonio! 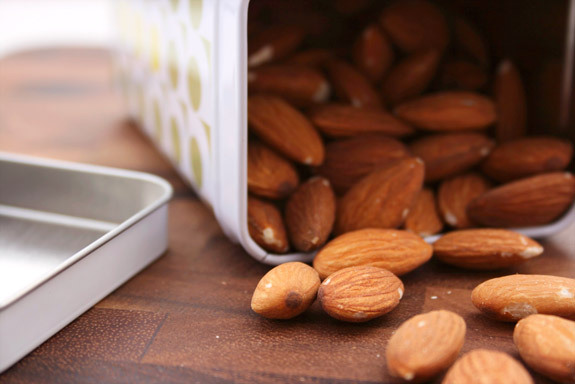 I love almonds and always have some in my pantry: toasted and natural. I will try your drink for sure 😀 Looks easy, refreshing and healthy! what a great recipe. I agree with you totally about almonds. 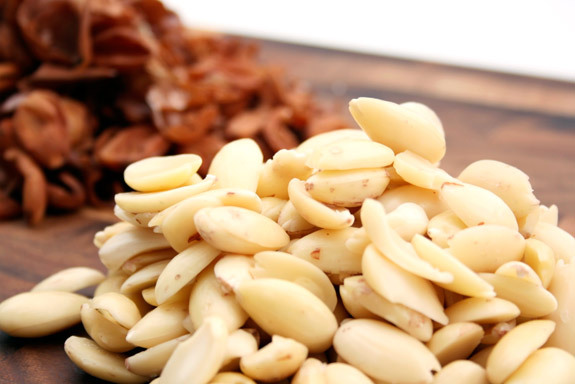 It is the healthiest nut one can get on earth. Thank you for sharing the info and the lovely recipe. Will surely try it out. I subscribed to your feed a couple of weeks ago when I found a link on the Spanish Recipes blog because I was immediately hooked by your photography — so congratulations on your anniversary and don’t worry about how long it takes you to capture those perfect photos!! Big congrats on the one year, Big Tony. I’m happy you’re sticking with it, because dude, your ideas and pictures are awesome. You have a real knack for plating and whatnot. So, I’m guessing your milk turned out better than the soaked cardboard, right? Of course it did. That wouldn’t be therapeutic then, it would be cardboard-apeutic. It is very difficult to refrain from eating the food before the photo shoot, due mostly to its extreme deliciousness. Happy bloggerversary! You’re doing quite well for a 1 year-old blog. 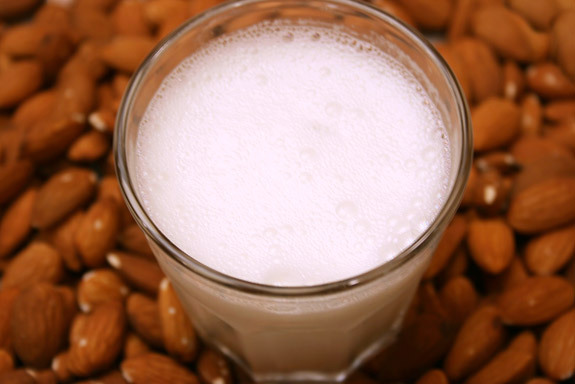 We Chinese have an almond milk drink – it already comes in powdered form. Hot or cold, I like it. Although I wonder if fresh made would taste even better. Happy Anniversary Tony and let’s celebrate by adding some rum to this drink and wearing the lamp shades! Happy Anniversary and we want you to stay in the food blogosphere for many, many years. It must be nice to still have those memories. happy anniversary! the pictures are stunning as usual. and yes, it was pink himalayan salt… and it was excellent with the biscotti! I always love pictures of nut milks, they look so wholesome and pure. I have never attempted making any milks. I have tried making a fresh barley tea that didn’t turn out the way I had envisioned. I should try this. hey cutie! happy anniversary! you are a breath of fresh air Tony and I love what you do here. Do you know we have a friend here who is also from Aleppo. Last time he was there he brought back lovely mini baklavas, which were so delicious. i remember back in Qatar one of my favorite juice and milk bars would serve this and it was the only type of milk i would drink back then. Happy first blog birthday, and here’s hoping there are many more to come! I love almond milk, but I’ve never taken the time to make it myself. This drink looks sort of like a short-cut almond milk, so maybe I’ll try it out with soymilk! Love the photo, can’t wait to try REAL almond milk…I found the carton-y stuff suitable only for smoothies. Metrically challenged as I am, however, I would love to see other measurements for the ingredients, even if they are as innocuous as “a handful of almonds” or whatever. Mmmm…almond milk! We drink it in Chinese culture, too – it’s good for bad coughs, and it’s really yummy as a hot drink when you get it fresh from a boba (bubble tea) cafe. Hurray !! Congrats to your 1st year 🙂 its been a pleasure visiting your wonderful blog, and reading all your wonderful recipes n stories. And thanks to you blog, i think i found a very good friend 😛 … looking forward to many many many more from you. PG: Thanks for the compliments! 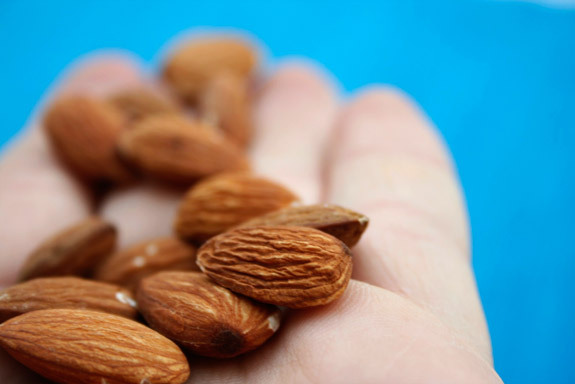 I seriously eat (at least) a handful of almonds a day, usually in my cereal in the morning. They’re my favorite! I hope you enjoy the beverage as much as I did! Joan: Thanks for subscribing Joan! I’m happy that you like my pictures… I love playing around with my camera. Thanks, Karen!! I miss our Cornell days – come visit soon! Nate: Thanks for the comment! This is one of the things I LOVE most about blogging, is learning about how different foods relate across cultures. I’m excited to read more about this Chinese variation. Hélène: Thanks for the sweet wishes! Those are memories that I will cherish for a while. I had an amazing time visiting that part of the world. Meeta… or shall I say Mee, hehe 😛 Thanks for the sweet wishes! OH MY GOD, the mini baklavas and all the pistachio desserts are one of the things I miss the most about Aleppo (beside the fam, of course). By the end of my stay I was on a first name basis with the sweets seller! I always ask about him when I talk to my cousins (they laugh). what do you say, we randezvous in Aleppo and hoard back lots of those delicious sweets : ) Your friend could be our accomplice, haha! Thanks, Hannah! Definitely try it out with the soy milk. I hope you enjoy it! Laura: Oh, I didn’t think of smoothies when I bought mine. I wish I had… I felt bad throwing it out, but it was nearly impossible for me to drink it straight. I’m sorry I didn’t add the non-metric measurements. I updated the recipe now and they should be up. I hope you enjoy the drink! silverkeys: I was addicted to bubble tea while I was at Cornell! I just graduated and have been on the look out for a new bubble tea shop in the DC area. I’m interested in reading about the Chinese variation of this drink as another blogger mentioned that, too! Very interesting drink and quite similar in my community. We added fine milled/grounded rice to the drink to thicken and also gingko nuts, lotus seeds, lily bulbs and occasionally, fried curlers a.k.a yew char koay (something like churros but not sweet). I love this drink very much because in Traditional Chinese Medicine it’s said that almonds help strengthen the lungs and overall general health. Thank you for sharing all those recipes and photographs. Happy One Year Anniversary! I have almonds almost every day as my snacks and never thought of making it to such delicious drink! This is a must try. Happy belated Tony! It’s hard to believe that you’ve only been blogging for a year. Your blog is so beautiful and polished, you’re like a seasoned pro! Oooh love this. There is a similar sort of drink that they make here in India known as Thandai…which basically means cooler! I find grating citrus fruits on the microplaner very therapeutic, as also making coffee decoctions & grinding coffee beans…aaaaaah nirvana!! Great Blog. Great pictures and recipes. I discovered it through Daring Bakers. 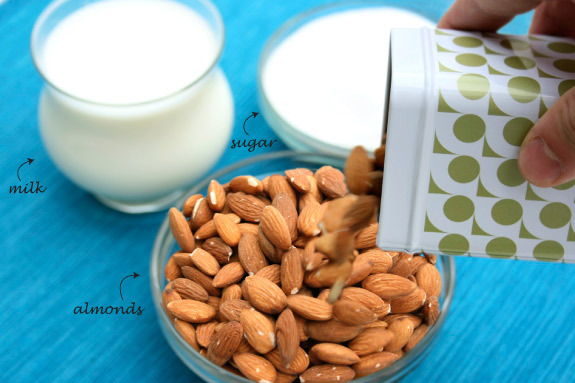 Love the pictures and definitely can’t wait to try the Almond Milk…yummy! I come from a long line of Greek women who can take a few, simple ingredients, and turn them into something amazing! I can relate to this recipe. This drink sounds simple and quite delicious. Tony Happy Blog Birthday! I love your entries. Truly inspiraational. Delicious. Love the arabic style of food and drink. Its amazing. My Palestinian friends speak very highly of the Aleppo and Nablus food history. I was told by them that the red pepper dip i love so much (muhammara) originates from Aleppo in Syria.